Orange Creamsicle Cupcakes, & a Giveaway! 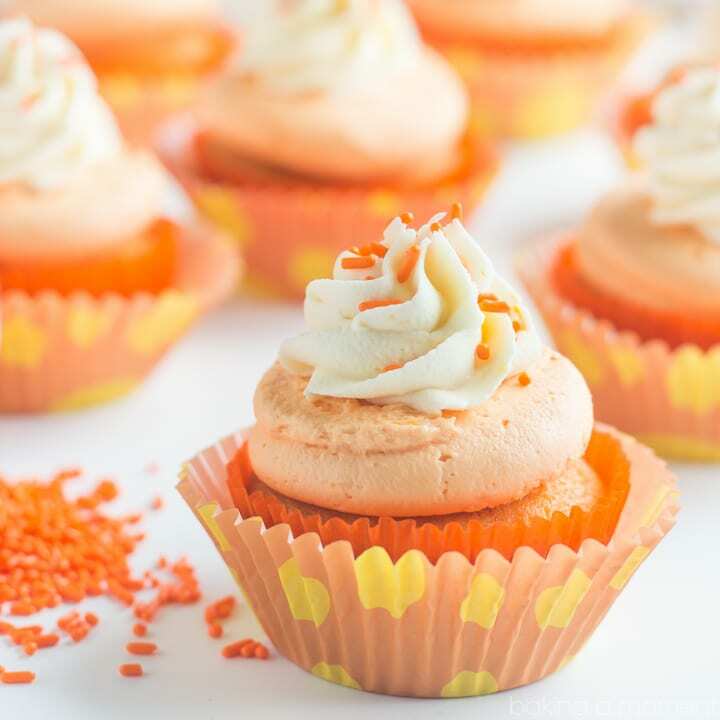 These orange creamsicle cupcakes are such a fun summertime treat! 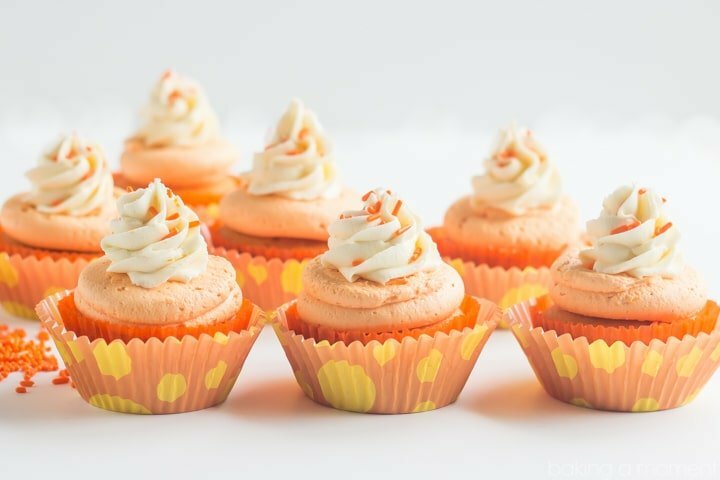 That same citrus-y vanilla flavor you loved as a kid, in cupcake form. Hey guys! I’ve got a really fun recipe for ya today. And a great giveaway too! Do you know Toni from Make Bake Celebrate? I had the pleasure of meeting her a year or so ago, and she’s just as nice in person as she comes across on her blog! I fell in love with her site way back in December 2013, when it inspired me to create these Chocolate Peppermint Meringue Christmas Trees. And now today, I’m once again putting my own spin on one of her fabulous ideas! Orange creamsicle is such a summertime classic. This happens to be a favorite flavor of my mom’s, so these babies are headed her way for sure! She gave up her entire Saturday to help me clear the junk out of my kids’ playroom this past weekend. It was no small task, let me assure you. It’s pretty mind-blowing how much C-R-A-P two kids can accumulate over the course of a few years. We packed up no less than half a dozen huge moving boxes full of toys, and scrubbed every surface of that room. It sparkles now. But enough about that! Let’s talk cupcakes. 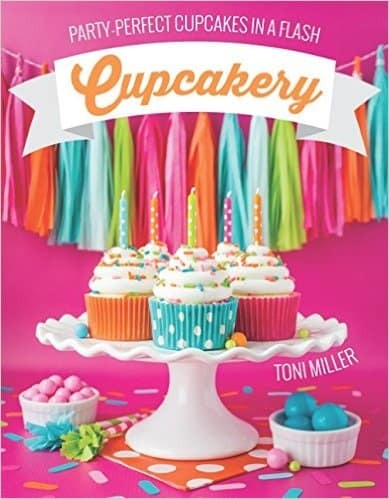 Toni’s new book Cupcakery is jam-packed with fun ideas like this one. In addition to some great baking and decorating tips and tricks, she’s got a cupcake recipe for any and every occasion. There are cupcakes for breakfast (her Cinnamon Roll Cupcakes spoke to my heart), cupcakes inspired by ice cream, cookies, and pie (hi Monster Cookie Dough Cupcakes), kid-inspired treats (my boys would go ga-ga over her Dirt Pudding Cupcakes), and lots of other creative ideas to wow your party guests. Then, the second half of the book is entirely devoted to cupcakes inspired by the seasons. And you know how much I love to bake with the seasons! She’s got a cupcake recipe for every holiday you can think of, and then some. Cupcakery is sort of a cross between a cookbook and a craft book. The recipes are super-simple (most start with a box mix), and the real star of the show is just the unique flavor combinations and the adorable way Toni has of styling her cupcakes with fun papers, beautifully piped swirls, and unique toppers. Toni has such an incredible aesthetic that is so bright, colorful, and happy- it just puts you right in a party mood! Since I have a thing for scratch-baking, and since Toni’s ideas are so adaptable, I’ve used my Even Simpler, More Perfect Vanilla Cupcakes as the starting point here, jazzing it up in just the same way Toni recommends doing with the box mix. The orange soda is such a fun addition and really brings out that creamsicle vibe! You can purchase Cupcakery here. I promise you won’t be disappointed! It’s such a fun read and there’s tons of useful info and inspiration. Preheat the oven to 350 degrees F and line the cupcake pans with papers. Place the cake flour, all-purpose flour, sugar, baking powder, baking soda, and salt in a large mixing bowl and whisk to combine. Add the softened butter, mixing on medium-low speed until the mixture resembles damp sand. Add the eggs, one at a time, making sure each one is fully incorporated before adding the next. Scrape the bottom and sides of the bowl with a silicone spatula, then add the sour cream, orange soda, vanilla, zest, and food coloring. Mix on medium speed for about a minute and a half. Scoop the batter into the prepared pans and bake for 15-18 minutes, or until the cupcakes spring back when pressed. Cool completely before frosting. Place the butter, extracts, zest, salt, and sugar in a large mixing bowl and beat on low speed until combined. Turn up the speed to medium-high and continue to beat for about 2 minutes or until fluffy. Drizzle in the milk, a tablespoon at a time, until it reaches a creamy, pipe-able consistency. Reserve about 1 cup of un-tinted frosting, then add the color to the remaining. 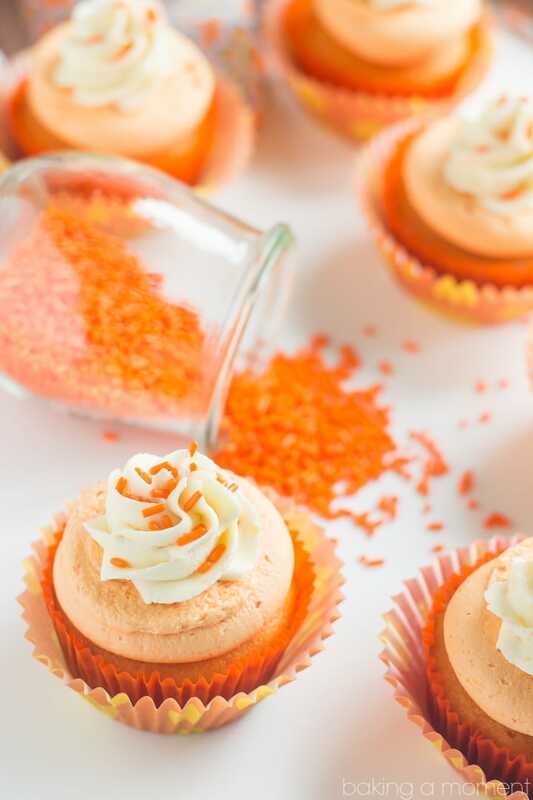 Pipe the orange frosting on the cupcakes using a large round tip, then top with swirls of un-tinted frosting (using a large star tip) and orange sprinkles. Oh what a fun nostalgic flavor for a cupcake! And SO perfect for this time of year! Thanks Nora! That’s just what I thought too! I have several birthdays coming up that it would be perfect for!!!! Yay! Hope you enjoy Gina! Thanks Medha! The styling was totally inspired by Toni’s book. She’s such a pro! 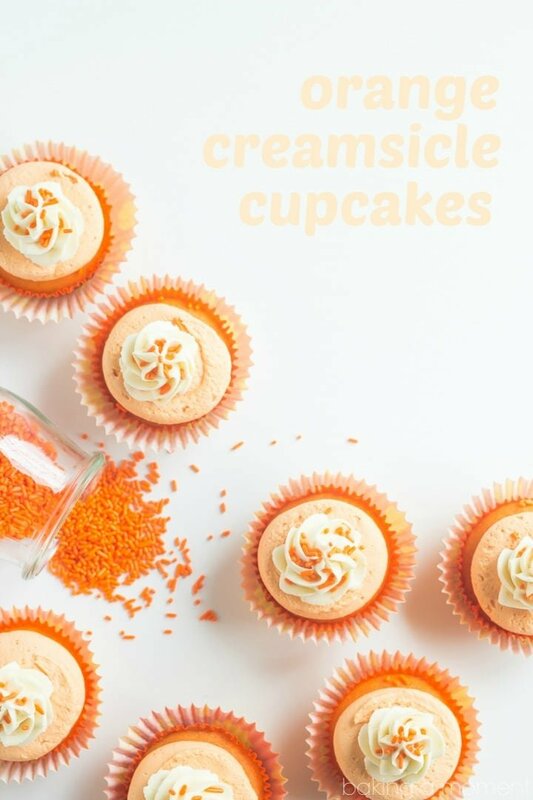 Love the creamsicle idea. Always my favorite treat as a kid. You and my mom both! So glad you enjoyed! I couldn’t agree more! Thanks so much Jan! Reminds me of summer vacation as a kid. Can’t wait to try them! Hope you enjoy Lorraine! Thanks so much! I know right? Toni is full of great ideas like that! Thanks June! These are so festive, Allie. I need to check out that cookbook, ASAP! Thanks Erin! The book is so fun and inspiring! Allie, I love these cupcakes!!! and can’t wait to check out Toni’s new book!! Thank you Alice! You are going to love it! I love the pictures, The orange looks divine and the styling too. Perfect for the upcoming Fourth of July celebration with several of our neighbors. Hooray! Hope you and your neighbors enjoy! In one word, YUM! These cupcakes are like a stroll through childhood. Love them so much, Allie! Aw thank you Jen! So happy you like them! These are seriously beyond gorgeous girlfriend! And I love anything creamsicle!!! Brings me back to childhood. definitely for birthday parties at the house!! My little one’s first birthday is coming up soon, so that would be the perfect event to celebrate with cupecakery cupcakes! I can’t for the life of me whip up a good American Buttercream, so would a SMBC work for this? 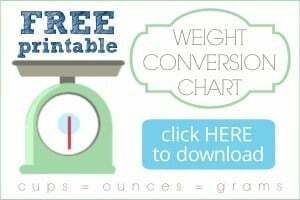 Have you tried halving this recipe? Any issues with it that you could expect to see? Hey McKenna! I’ve halved it and it works just fine. Good luck and enjoy!